​The Elaine Brown Award for Choral Excellence is presented to an individual for outstanding lifelong work in the choral art. Started in 1998, this award is named in honor of Elaine Brown, the founder/director of Singing City in Philadelphia, PA.
She was born Elaine Isaacson in the northeast Pennsylvania town of Ridgeway in 1910. Her mother was an organist and choirmaster, taking her to choir rehearsals as a baby in a basket and later serving as her first piano teacher. She left Ridgeway at the age of sixteen to pursue a degree in music education at the Bush Conservatory (now Northpark College) in Chicago. 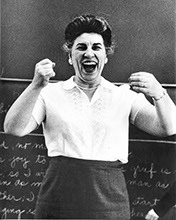 In 1929 Dr. Brown began her first teaching job in Jamestown NY, but when Westminster Choir College under the direction of John Finley Williamson, came through Jamestown on a concert tour, she became so inspired she gave up her teaching job to pursue another bachelors degree at Westminster, receiving that degree in 1934. She received a Master degree from Temple in 1945. At that time she joined the faculty at Temple University. It was during this period of her career that she was contacted by Fellowship House to discuss the establishment of a volunteer choir open to community members. Within the first few seasons, the Choir was presenting over 45 performances each year. After a one year sabbatical spent serving on the faculty of the Julliard School at the invitation of William Schuman, she returned to Philadelphia and in 1948, transformed the Fellowship House Choir into Singing City, now one of the most respected cultural institutions in the City. Elaine Brown resigned her appointment at Temple in 1956 and Singing City became her "life" (and some would say obsession) until her retirement in 1987. Elaine Brown passed away in 1997 at the age of 87. The recipient of many awards and recognitions from musical and humanitarian organizations, Elaine Brown was also the first American woman to conduct The Philadelphia Orchestra. Her honors are impressive but it was Singing City that held her heart. The selection will be made by the Executive Board of ACDA PA and will be presented at the fall conference. The award shall consist of a commemorative plaque and a complimentary conference registration.